I still remember the first Howard Waldrop story that I read. It was called “Mr. Goober’s Show” and it had been recommended because it was supposed to be similar to Candle Cove. It some respects it was, but in other respects, it was so much better. It blended nostalgia and depression and the rose-tinted glasses that come with being young and open to a world of possibilities together into one story that dug into my heart and then stayed there. Howard Waldrop is one of the best writers I have read, which is interesting because I haven’t actually read one of his books yet. He’s written a few, not many, because most of his output is short fiction. And most of that output is hard to find, because it’s out of print. I currently have three volumes of his short stories (Things Will Never Be the Same, Other Worlds, Better Lives, and Horse of a Different Color and they only collect the “best of” stories, not all of them). Howard Waldrop’s short stories contain some of the most inventive premises I’ve seen — and then Waldrop manages to back up the premise with some amazing prose. Take “The Ugly Chickens,” for example, which won a Nebula Award in 1980 for Best Novelette. 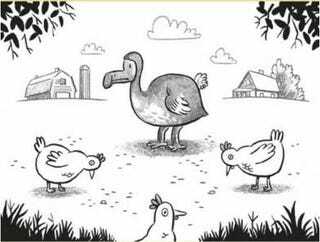 The short story — which can be read in about twenty minutes, really — is about an ornithologist who discovers that there was a family in the South that raised dodos after the dodo had already gone extinct. Or take “Flying Saucer Rock-N-Roll,” which mixes Fifties doo-wop with, well, Fifties science fiction. Talk about Danny and the Juniors, talk about the Spaniels, the Contours, Sonny Till and the Orioles. They made it to the big time: records, tours, sock hops at $500 a night. Fame and glory. But you never heard of the Kool-Tones, because they achieved their apotheosis and their apocalypse on the same night, and then they broke up. Some still talk about that night, but so much happened, the Kool-Tones get lost in the shuffle. And who’s going to believe a bunch of kids, anyway? The cops didn’t, and their parents didn’t. It was only two years after the President had been shot in Dallas, and people were still scared. This, then, is the Kool-Tones story. Or “Night of the Cooters,” which is The War of the Worlds from the perspective of a small town sheriff in Texas. Or “Mary Margaret Road-Grader,” which depicts Native American life in a post-apocalyptic world. Or, one of his best stories, “Heirs of the Perisphere,” about animatronic characters at Disneyland waking up 1,500 years in the future. Things had not been going well at the factory for the last fifteen hundred years or so. A rare thunderstorm, soaking rain, and a freak lightning bolt changed all that. When the lightning hit, an emergency generator went to work as it had been built to do a millennium and a half before. It cranked up and ran the assembly line just long enough, before freezing up and shedding its brushes and armatures in a fine spray, to finish some work in the custom design section. The factory completed, hastily programmed, and wrongly certified as approved the three products which had been on the assembly line fifteen centuries before. Then the place went dark again. Still, though, my favorite will always be my first, “Mr. Goober’s Show.” I just love the way it ends. And in a few minutes he’ll leave, because the band will have started, and conversation, except at the 100-decibel level, is over for the night. But he’ll be back tomorrow night. And the night after. And all the star-filled nights that follow that one. I highly recommend reading one or all of Howard Waldrop’s stories.